As you know Search engines are the main source of organic traffic on Internet today where Google is most popular among all other search engine. So In this post, I am going to share Top 100 Free Search Engine Submission Sites List For Quick SEO to enable blog/website owners to submit the URL of their blogs. Although a majority of blog owners submit their blogs’s sitemap to Google for Indexing, I would strongly recommend you to submit your blog or website to other popular search engines also as it would give you a extra boost in traffic. Search engine submission is a process of Index your Website or blog In Search Engines .It is an effective tool of web promotion. It refers to the direct submission of a website to a search engine. It is a form of internet marketing that helps a webmasters increase the rankings of a web pages or pages.I would highly recommend manually submitting your website pages to the search engines. That said, the search engines give no guarantee of ranking your page because you have manually submitted it. It is a tool that we use to let the search engines know that we have new information to share. It is important to submit your site’s pages to all of the major search engines (Google, Yahoo!, Bing) because even though the other engines have less traffic than Google, they still have millions of users. When you submit a URL or domain name to the search engines, it could take anywhere from two to four weeks to get indexed. Sometimes your page will not get indexed after you submit it, if that occurs, wait four weeks and then resubmit the page again. 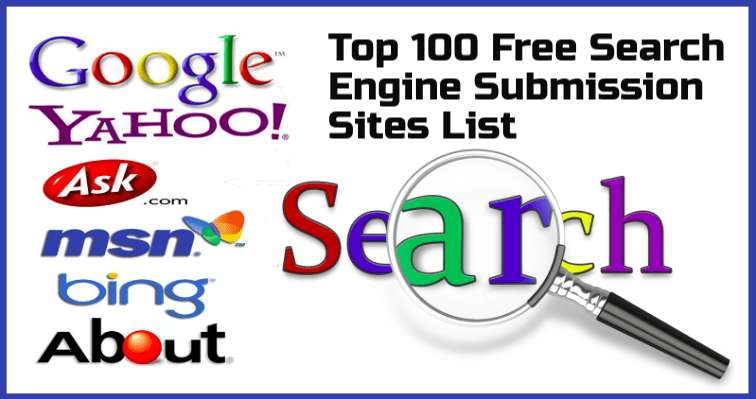 Following are the list of Top 100 Free Search Engine Submission Sites List to submit the URL of your blogs/websites.